Every now and then we all need to take a break from the concrete jungle and just lose ourselves in the divinity of nature. If you are planning your next camping adventure and don’t want to embark without knowing that you’ll have the comfort of a spacious awning, you have probably already started the – not quite easy – search for the ideal awnings for your ride. Size, material, coating, price – what matters most? Self-supporting or not? Inflatable or conventional? 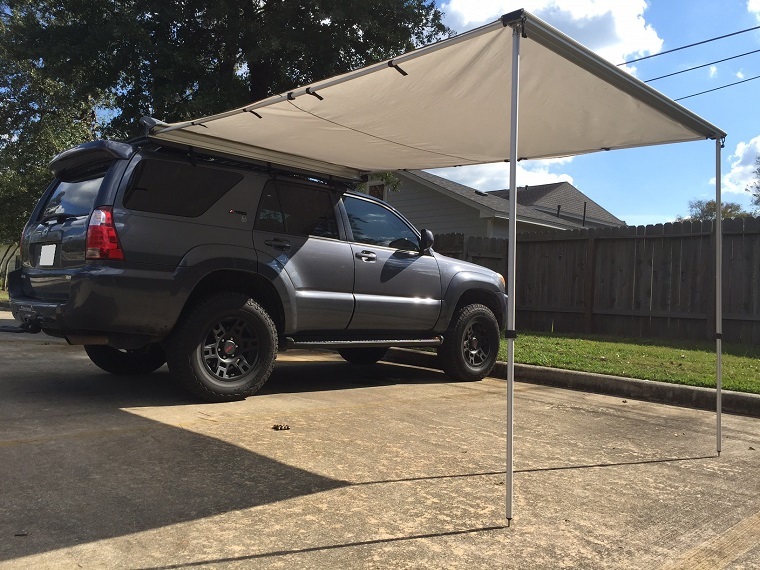 In today’s blog post, I’ll provide some information and guidelines to help you find the best awnings for 4×4 vehicles. Let’s get to work. Size is going to be the number one factor in deciding what kind of awning will fit your vehicle. There are two types of awnings that will determine the size you need to get. Self-supporting awnings for 4×4 vehicles attach to the side and here you will need to determine the size by using a string to measure the piping rail at the vehicle’s roof. For non-self-supporting awnings, you will need to determine the circulation length, which can also be done using a string, except you will start from the ground rear of the vehicle, then go through the piping rails and end at the ground in front of the vehicle. You can choose from the three types of awning materials – cotton, polycotton, and 100% polyester. A cotton awning is going to be perfect if you want a material that won’t rot or be susceptible to mold – it is a very robust, breathable and lightweight material. Awnings for 4×4 vehicles made from 100% polyester are both lightweight and robust but they are hardly breathable. Polycotton is a blend between cotton and polyester which combines the strength of polyester and the breathability of the cotton. There are a lot of different features that awnings can offer, such as having an electrical pump or the option for having fiberglass poles. With inflatable awnings, you will notice an increase in speed as you won’t need a manual or a set of tools in order to mount them. Although you will have to attach some of them with guy ropes, it will mostly be an easier job than having to put poles in the ground. Also, you can have an awning with a two-layer air hose system if you want to use an electric pump. Conventional awnings are sturdier and have higher chances of staying on the ground in case there are high winds. The better and more protective coating an awning has – the heavier it will get. This, consequently, will take more time to get it back in place, but not every coating will have this effect on it. There are two types of coatings you can choose from – PVC or Acrylate coating. The PVC coating is the one that makes it heavier but it also makes the awning more robust and windproof and you can even have it double coated if you want to. On the other hand, Acrylate is perfect if you only want your awning to be water repellent but not that heavy. Acrylate is a material that doesn’t require much care.